When I’m not making battle maps, thinking of reasons why I shouldn’t purchase new minis, or otherwise thinking about D&D, I read comic books. I still have a good sized collection from my childhood, and I’ve been rereading some of my older stuff from the early 1980s. Perhaps more enjoyable than the comics themselves are the ads, which provide an amazing snapshot into popular culture from the time. It was while reading a few old ads that I came across the inspiration for this installment of D&Development. Finding ads for D&D in comic books was hardly uncommon. After all, there was a good overlap between comic fans and D&D’s target audience. Brief, one page comic-style ads for D&D made the game appear very interesting to me as a child, and I’m certain that my first actual exposure to the game came from such ads. However, it was seeing another ad, this one for the animated series based on D&D, that reminded me how much that show influenced me as a D&D fan. The Dungeons & Dragons cartoon began in the fall of 1983, which was a full year before I had my first “real” session of the game on the playground in 5th grade. The setup was intriguing, with a group of children riding a (scary looking, to a 9 year old) roller coaster that transported them to a magical fantasy world. There, they met the Dungeon Master, a quirky, powerful, yet odd little man who cast a spell enabling the kids to adapt to their strange new surroundings. Seeing this played out on my TV screen on Saturday Morning with the Smurfs and He-Man just about blew my mind. 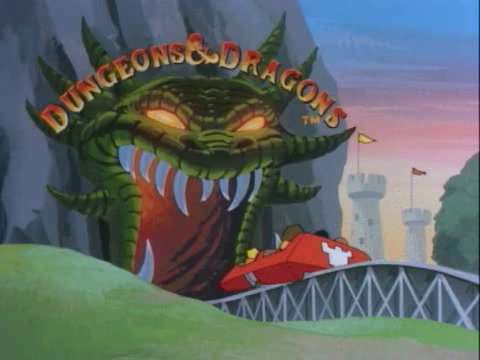 Looking back on it, the D&D cartoon was little more than a glorified, half hour long commerical. The animation wasn’t very good at all, and the stories weren’t particularly memorable. The characters themselves followed the common pattern of the time in that they played to stereotypes. You had the perfect leader, the cowardly whiner, the young kid who the viewers could relate to, and even a cute little mascot. But even with its many flaws, the show had an impact on me, one that would have a tremendous effect on my time as a player of D&D and more importantly as a DM. Perhaps the most obvious thing that the cartoon taught me was about character classes. One would think that the show would include the classic four from the dawn of D&D’s history: fighter, cleric, magic-user, and thief. Instead, only the latter two made it into the show directly. Instead of a straight fighter, we got three subclasses: ranger, barbarian, and cavalier. Alongside the thief was another oddity, the acrobat. When I began playing D&D myself, using the classic red box set, I was shocked that these four classes were not included. Why would there be classes in the cartoon that were unavailable in the game itself? The ranger, barbarian, and cavalier could be considered fighters, sure. But the acrobat was totally unlike anything from basic D&D. And where was the party’s cleric, anyway? It was several years later, when I moved on to AD&D 2nd Edition, that I learned where these strange classes came from. In a friend’s battered old copy of Unearthed Arcana, the cavalier, barbarian, and acrobat were presented as classes. The ranger, of course, was from the AD&D Player’s Handbook. Interestingly, I still to this day don’t think of cavaliers as riding horses, though that’s one of the defining features of the class. I attribute this to the cartoon. The image of mounted knight riding into battle just isn’t as ingrained into my brain as seeing Eric walking around with the rest of the party is! Beyond the classes, the weapons used by the group shaped my understanding of what magic items were supposed to be. It seemed like most of the items in the Basic red box and even the Expert sets were fairly mundane. A +1 sword was great mechanically but very plain otherwise. I tended to use magic items that were clearly magical, that looked cool (in my imagination, at least) in addition to being handy in battle. Magical weapons in my D&D games had a tendency to be on fire, covered in lightning, or have the ability to talk. Of course, every single bow I ever gave out supplied it’s own magical arrows, just like Hank’s iconic weapon. I handed out bags of holding like candy, since they allowed me to pretty much ignore encumbrance and they also reminded me of Presto’s hat. This inclination for even the simplest magic items to be epic in feel is something I see myself doing even in my 4E campaign today. 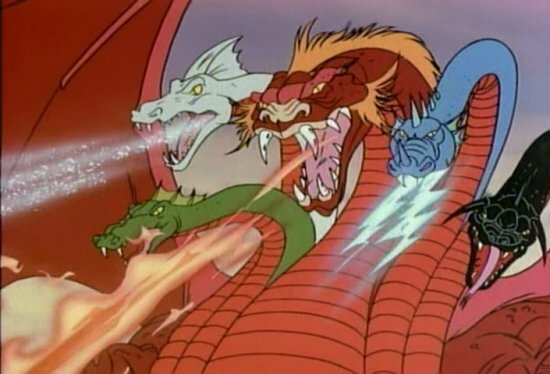 The villains in the D&D cartoon were formative for me as well. Venger may have been somewhat stereotypical as far as his actions went, but his character design was amazing. 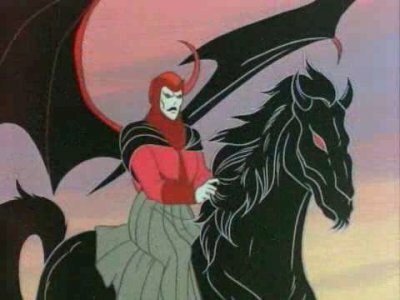 Fangs, batwings, pale white skin, and the asymmetrical one-horned hat, plus a sweet demonic horse to fly around on… he was far cooler than any of the good guys were (except Presto, MAYBE). And that voice! Peter Cullen is spectacular. If the big bad evil guy in your campaign is even half as “good” as Venger, you should be glad. The other main antagonist, Tiamat, was like something right out of my 9 year old mind. If a dragon was the greatest foe you could fight, a dragon with five heads had to be the ultimate challenge. My love for Tiamat on the show made me even more of a fan of Dragonlance than I might have been otherwise, since Takhisis was so similar. I’ve always liked having dragons in my campaigns, and I must admit that especially in my first few campaigns, I overused them. Balancing my desire to use dragons all the time along with making them still feel special and intimidating is tough for me. My current 4E campaign involves a delve into a temple of Tiamat, and I’ve enjoyed designing and running these sessions immensely. Though the D&D cartoon wasn’t the greatest animated effort, and the characters were a bit bland, and the stories were hokey, it had a huge influence on me. 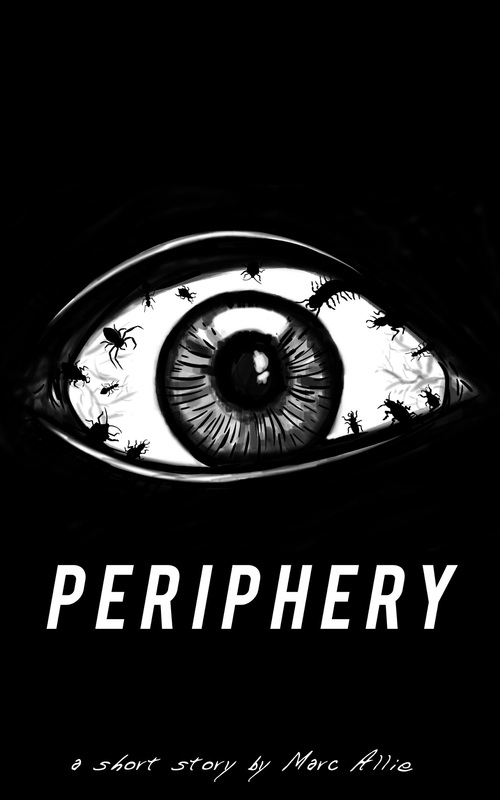 It taught me about character classes and the importance of a party working together. It showed me how exciting and creative that magical items and spells could be. And it gave me two great templ;ates for villains that I would use in many campaigns throughout my DMing career. The D&D show was the earliest and perhaps one of the biggest influences on my development as a player and DM. This entry was posted in D&D, DM Advice, Dungeons & Dragons, Roleplaying and tagged D&D Cartoon, D&Development. Bookmark the permalink.